I loved going with our family in the Buick to Iowa to visit Grandpa and Grandma Gauger. I remember Paulene and I would get new burmuda short outfits to wear! We spent 2 or 3 days traveling on the road…yes, all three of us Gauger kids in the back seat…I don’t recall fighting or complaining. The comic books that Paulene mentioned were great…we would trade off when we read them, besides Little LuLu we would have the Archie’s, too. Mom always had her cross word puzzle book and I loved helping her. I would always have a book to read from the library, too. I can still see my Mother’s arm relaxed on the back of the front seat and the arthritis beginning in her hands. She would get so mad at Dad because he was a risk taker when he passed slower vehicles and many times we would make it back in the correct lane just in time. When we would get tired, Dennis would sprawl out on the floor of the car to sleep. I loved eating in restaurants (nothing has changed there!) and would always order first, knowing just what I wanted. The Burma Shaves were fun…and Dad would always add a few he would make up that were funnier and more colorful and Mom would say…”Oh,Goggy!” I loved to watch the rows of corn fields go by, they were so uniformed. 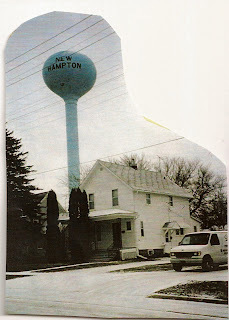 Coming into New Hampton, we would always look for the big water tower. I can still hear the tea kettle “singing” on their stove and Grandma Gauger with her apron on and Grandpa Gauger with his pipe. When it would thunder and lightning there, the clouds looked to me like a big ocean, they went right to the ground, as did the big streaks of lightening. I was terribly afraid of storms anyway and with no mountains, I didn’t feel safe when those storms came. Grandpa and Grandma Gauger’s yard had plenty of places to explore and play hide and seek. Even though Grandma didn’t smile much, she had a proud little smirk that eventually turned into a smile and laughter when Dad and Grandpa and Uncle Ralph, Dad’s brother, would tell their fun and colorful stories. And she could tell a few herself! I remember the trip I took with Paulene and Dave from Connecticut – Maryland – through Iowa – to Utah! We traveled in their station wagon and Jef, Paul, Audrey, and Rikki all rode in the back. Alisa was just small and it was a hot, humid summer back East. Stopping at Grandma’s was a wonderful time…she was so amazed they we were all traveling together and loved seeing all the great grandkids. She was tickled that they were so astonished at the lightening bugs…my Jef was a little afraid of them. When Dale and I moved from Maryland, we stopped and stayed overnight with Aunt Rosella and Uncle Ralph. When we got into town, we headed straight to Grandma Gauger’s to see her. She was very pleased that we stopped there first and was glad to see us and to meet Dale. Aunt Rosella told me later that I sure knew my Grandma and how she bragged that she got the first visit! 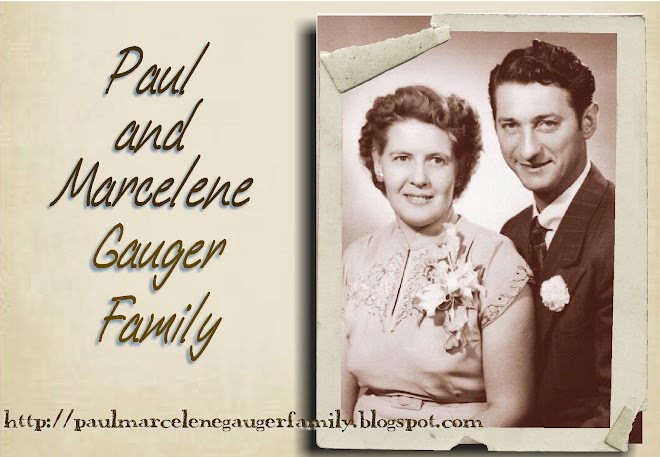 I didn’t realize that I haven’t talked that much about my Gauger Grandparents. I will have to do more because I love them and I have these fond memories that will keep them close in my heart. Below is a picture taken July 4, 1954 at our first Highland, Utah home. It must have been a "girls" shot. 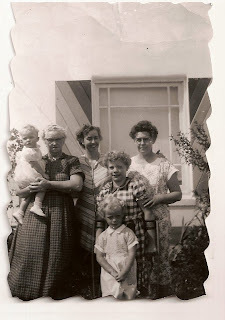 L to R: Grandma Gauger holding me; Aunt Rosella, Dad's brother Ralph's wife; Mother; Julie and Paulene in front.